Can I just say, I'm really impressed with myself today. Not only do I have these tot activities finished for the month of March, but I'm actually posting them before March 1st too. This is amazing for me! I hope you enjoy the activities. I had a lot of fun planning and preparing them. Sunshine is sure to have fun. Just a reminder for those who haven't done so, you can now follow me on facebook. If for some reason the link doesn't work, just type in Every Star Is Different and you'll be able to find me. I'd love to see you there. Also, if you aren't already, I'd love for you to follow me here on my blog. It's so fun getting to know my readers! These cards are working perfect for Sunshine in preparation for 3 part cards. Last month she was only able to match up three out of four cards correctly, half of the time. I'm hoping this month, now that the activity is more familiar she'll do better. We'll see. If nothing else she'll have fun learning some new words and playing with manipulatives. 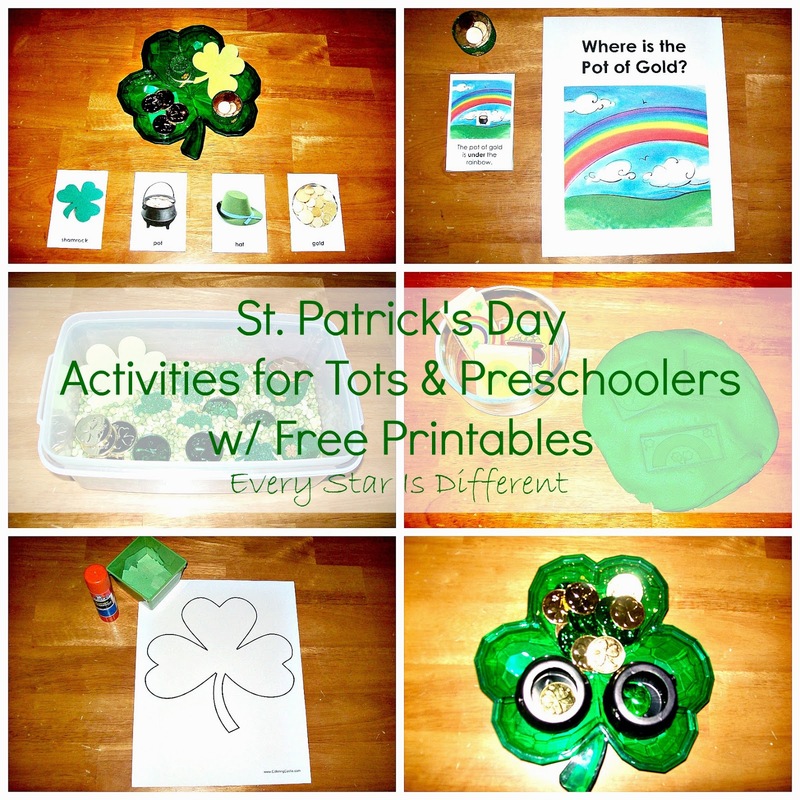 Source: I created this activity as part of my St. Patrick's Day Tot Printable Pack. For your free copy, click on the link at the end of this post. In this activity Sunshine and I will work together. I'll read the statement on the bottom of the control card, pointing to where the pot of gold is in the picture. She'll then place her pot of gold on her rainbow picture. There are four cards in all. I'm hoping by St. Patrick's Day she'll be able to tell me where the pot of gold is in each picture. Sunshine didn't quite grasp the concept of numbers and counting last month. There wasn't a single day that I could get her to count to two, even by mimicking me. I'm not giving up though. Numbers can be a hard concept for little ones sometimes. This month we're concentrating on the number four. I found the 50th Anniversary Lucky Charms box at the grocery store the other day and just couldn't pass it up. Sunshine loves Lucky Charms, especially the marshmallows. I thought they'd be perfect counters for our number activity. Yummy food is definitely an incentive for Sunshine. We're focusing on two colors this month, green and gold. Sunshine will sort the coins by color and put them in their proper pots. I love how they fit so nicely. Sunshine has never used glue before. Last month she really struggled holding the dot marker properly. Perhaps a glue stick will give her more practice. In this activity Sunshine will glue the green pieces of paper to the shamrock. Source: The printable for this activity can be found at Coloring Castle. I've seen all these cute ideas for letter stamps lately. I thought it might be fun to use our St. Patrick's Day Stamps in green play dough. Sunshine struggles with hand and finger strength. Perhaps this will help her develop those muscles a little bit more. Source: I create this activity. Sunshine's not really a fan of sensory bins, but that doesn't stop me from trying them every so often. The base of this bin is dried split peas. Included are four manipulatives that match our vocabulary activity, as well as other St. Patrick's Day items. Sunshine did a fabulous job with her activities last month, asking for them almost every day. I'm hoping this month will go the same. I never have any expectations though. She can be quite unpredictable at times. It's important to always keep learning fun! Don't forget, it's important to make sure you can supervise your toddler while they're doing the activities above. I find it best to use the activities when I have one-on-one time with Sunshine. This way I'm able to ensure that she stays safe with all manipulatives etc. For those interested in the free printable pack, click on the link below! I hope you have a fabulous St. Patrick's Day with your little one! Love the "Where is the Pot of Gold" activity! What a wonderful idea! I may have to use it when we do St. Patrick's Day activities! What great activities! My favorite is the "Where is the Pot of Gold". Brilliant! What fun! 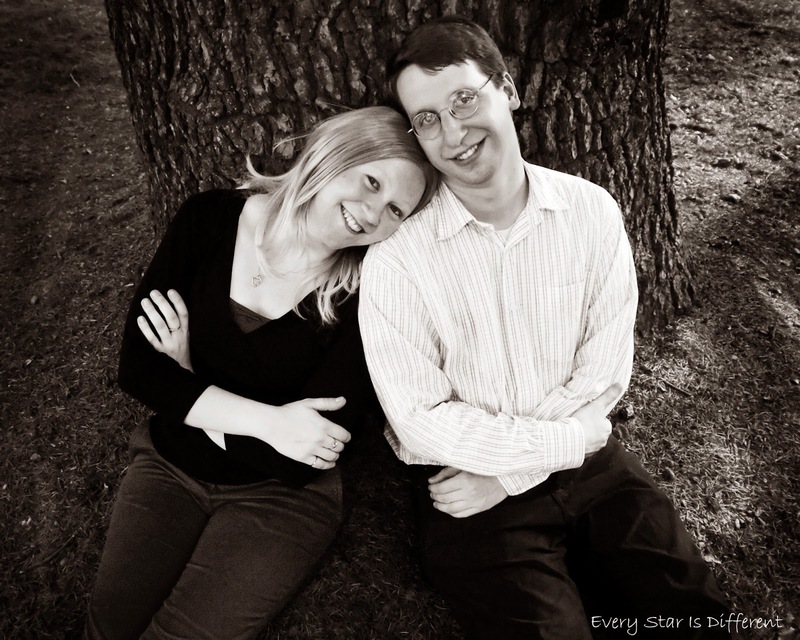 Thanks for sharing on Makeovers & Motherhood! 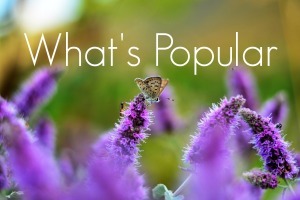 Hope you'll join us again on our Welcome Party Wednesday Link-Up! I love the sensory bin idea. I can just imagine my kid saying "What is this?" for every item, since we have never covered this celebration before. More green fun! I love the number cards! I love those stamps! And I am excited to set-up a sensory bin for St. Patrick's as well.